“No communities of people on this earth have been more negatively impacted by the current global economic system than the world’s remaining 350 million indigenous peoples. And no peoples are so strenuously and, lately, successfully resisting these invasions and inroads.”— from the introduction by Jerry Mander. 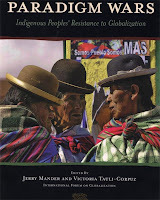 Paradigm Wars: Indigenous Peoples’ Resistance to Globalization accurately conveys the “impressive scale and clarity of purpose” of an indigenous movement worldwide that is now gathering strength and planning the future of our earth by scrutinizing the present reality of economic globalization. From the indigenous platform, Mander and Tauli-Corpuz put forth various issues which address the projects of corporations, institutions, and governments that threaten our finite planet by requiring an “ever-increasing supply of natural resources” and supportive infrastructure for short-term profit. Emphasizing the international interconnectedness of law, action, and ancient cultures, Paradigm Wars offers readers a poignant, much-needed briefing on a pressing situation resting on all our shoulders. This entry was posted in Globalization, Social Change. Bookmark the permalink.